Welcome to K9 Training Camp! View our calendar of current classes below. To sign up for a class, click on the “Register for a Class” button. Unless otherwise notified, please NO DOGS TO THE FIRST CLASS! Gives you a great start with your new “family” member. 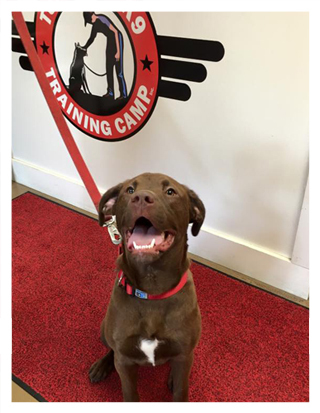 Puppy Training classes are an excellent opportunity for socialization. Class teaches family members the reasons for the puppy behavior and important handling skills. Puppy classes are a vital part in the developmental stages of your growing dog. It also helps your puppy bond with it’s new family and other puppies in the class. Basic Obedience Class teaches dogs of all ages the basic techniques/commands below. There are other skills taught as well as plenty of open discussions. The CGC Program is designed to reward dogs who have good manners at home and in the community. The Canine Good Citizen Program is a two-part program that stresses responsible pet ownership for owners and basic good manners for dogs. All dogs who pass the 10-step CGC test may receive a certificate from the American Kennel Club. After signing the Responsible Dog Owners Pledge, owners and their dogs are ready to take the CGC Test. Items on the Canine Good Citizen Test include: Accepting a friendly stranger, Sitting politely for petting, Appearance and grooming, Out for a walk (walking on a loose lead), Walking through a crowd, Sit and down on command and Staying in place, Coming when called, Reaction to another dog, Reaction to distraction, Supervised separation. Private lessons are offered in your home and conducted one on one with you and your family members. The class will also help to develop a bond and the safe zones in your home for your new member. Once the safe zones have been established other commands in Basic Obedience will be taught in the home. Is you canine companion having difficulties relaxing around strangers or other dogs? Do you feel your canine companion may be anxious? The calming and relaxing class is designed to assist you in working with your canine through massage and relaxation techniques. The class is limited to five participants and each participant is required to bring a carpet remnant to each class. Does your dog have an abundance of energy? Our Games and Tricks class is designed to burn off some of the energy as well as building the bond between the human and their canine companion with a focus on the handler. This class is not for dogs that have leash reactivity concerns. There will be some quick movement and turns for both the dogs and the handlers. This class is limited to five participants. Is your dog overly excited on a walk? Are you having trouble getting them to come to when you call them? Do you have a dog that is go, go, go with no resting? The 3R’s class is for you, in this class you will teach your canine companion “home” to a mat. The “home” is a place to relax after the game of retrieve and recall. It is a place when company comes to visit. This is class is a great opportunity for dogs with fear and or are lacking social skills. Six foot leather or nylon leash (the thickness and size of the leash depends on the size of the dog). Retractable leashes are not acceptable for training. Training collar properly fitted for the dog. Head collars are typically recommended for dogs that pull on the leash. A head collar has a strap that goes around the dog’s neck right behind the ears and has a loop or strap that goes over the nose. The leash is attached where these two straps come together usually at the base of the dogs lower jaw near the neck. Flat buckle collars are great for calm and shy dogs. The collar must be in good condition. A 30 foot nylon training lead (dogs under 10 pounds may use a 15 foot lead). The training lead is used for long distance work during class. The lead must be in good condition. Approximately 150 pea sized soft treat that your dog really likes. You will need a training pouch or a pant/shirt pocket to house the treats. Make sure your dog has a good appetite for class. Food should be withheld for approximately six to eight hours before class depending on the age of your dog. All dogs should have identification. Micro-chipping, tattooing, or a simple to read ID tag stating the owner’s name and phone number should be attached to each dogs collar. Proper shoes prevent injury. No open-toed shoes or sandals. A pooper scooper or similar type of waste disposal tool. Children attending or watching the class must be supervised by another adult that is NOT participating in the class. A COPY of the immunizations must be brought to the first class. Oh and don’t forget the DOG! Rich started working with dog many years ago, in the days when dominance theory prevailed and using fear, force, intimidation and painful punishment was the supposedly the only way it could be done. He worked in many different avenues from obedience to protection training, but for him it was always to stressful (for both the handler and the dog) to be waiting for the dog to make a “mistake” so the human could “correct” it. After years of using prong and shock collars, Rich wanted a better way to communicate with his furry family members so he began learning more modern and scientific ways to communicate with his canine companions, when he noticed he and his dogs enjoyed the time together much more, and he was very impressed with the speed at which the dogs learned and retained the teachings. Joe is a certified Dog Trainer in Hilton, New York and graduated with honors from the Animal Behavioral College, an internationally recognized training and certification program. He recognizes the importance of the relationship between the person and their canine companion. His primary focus is on forming a mutually respectful and trusting relationship. Each dog and their human companion have their unique potential that is uncovered in the training encounter. The approach is based on the current and ever evolving scientific understanding of both psychology and behavior. Positive reinforcement, counter conditioning and motivation are the primary techniques used to look at shaping behavioral change. Joe’s approach does not limit the relationship to shaping behavior alone. It also focuses on building a sense of resilience and emotional confidence in the dog and encourages this to be brought to the relationship with its human companion. Aspects of the training encounter include establishing clear communication, setting clear and consistent boundaries and limits, fostering a sense of trust and respect and looking at reciprocity between both the dog and its human partner. An ongoing dialogue between the two is explored offering appropriate compromise and respect on both sides of the relationship. Not every person has the same talents and abilities and this is true for dogs too. The diversity and unique abilities of each dog will be explored and valued. Joe teaches and speaks nationally and internationally on human animal bond and partners with animals in his medical practice. We do NOT allow the following devices to be used in our training classes and or facility: E-Collars (shock or electronic), prong collars, choke chains. Due to allergies, we are a peanut-free facility. Please do not bring peanut products into our building.